The babies were delivered in the same hospital where victims are being treated. 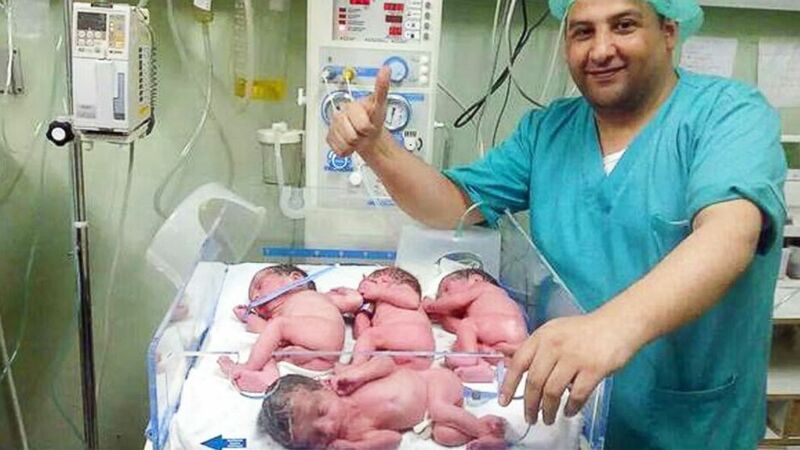 camera (@DrBasselAbuward/Twitter) Dr.Bassel Abuwarda posted this image to her Twitter account on July 31, 2014 with the text, "Despite the pain, Palestinian mother gave birth to quadruplets last night in #Gaza." A Palestinian woman gave birth to quadruplets in Gaza Wednesday, a sign of optimism amid ongoing bloodshed in the region that has claimed more than 1,400 lives. Dr. Bassel Abuwarda posted a photo online showing the babies to Twitter, with a doctor giving a thumbs up to the camera as he stands next to the babies' incubator. ABC News confirmed that the mother, who is from Rafah near the southern tip of Gaza, gave birth to three boys and one girl, all of whom are doing well today. “Despite the pain, Palestinian mother gave birth to quadruplets last night,” Abuwarda wrote. Gaza’s hospitals have taken direct hits in fighting between Hamas and Israel over the last week, and have been damaged as medical staff care for the thousands of people who have been injured in the conflict. The quadruplets were delivered in the same hospital where many of the conflict’s victims have been treated. At least 1,390 people have died in Gaza and more than 8,000 have been injured in the three-week conflict, according to the Palestinian health ministry. In Israel, 59 people, including 56 soldiers, have died.